AboutBeanies offers the latest Ty Beanie Baby news, history and information. Visit our forums to meet collectors from around the world, or Search for your favorite Beanie! ANNOUNCEMENT: I will no longer be updating About Beanies. 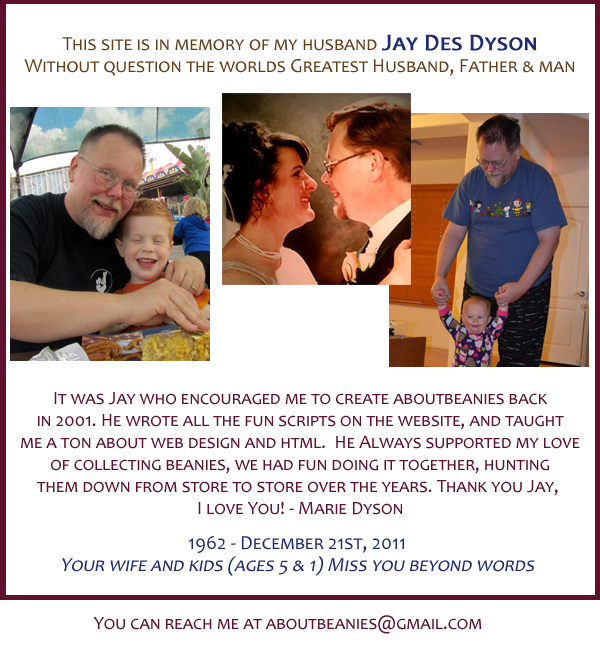 I started About Beanies April 2nd, 2001 and it was my first introduction to running a website. What a fun many years it has been! I meet a lot of people along the way and learned so much more then facts about Beanie Babies! I wish I had the time to keep up on the Beanie news and all else important in life, but I can't. Due to space and money I stopped collecting Beanie Babies last year when our son was born and we moved to Arizona. It just isn't the same. I proudly display my curio full of Beanies in our dining room. I suspect they will always be there for years to come. Site Updates: Current Beanie Babies Checklist has been updated today!